ARCADIA, Calif. (KABC) -- Arcadia police used a bait box to catch suspected package thieves, who also turned out to allegedly have a stolen car, drugs and a taser. A bait package equipped with a GPS device was left on a porch of a home in the 1700 block of N. Highland Oaks, police said. The package was stolen on Dec. 8 and police used the GPS to track down the suspects a short time later in a business parking lot on Huntington Drive in Monrovia. They found the bait package with the suspects, but also say they discovered an added bonus: drugs, stolen mail, burglary tools, a ski mask and a taser in their Honda Accord. Then they found out the car itself had been stolen two days earlier. 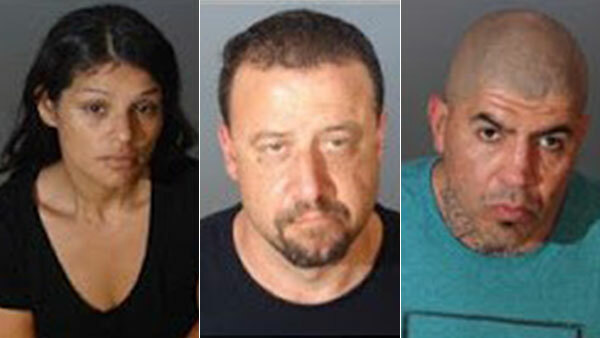 Police they say arrested and booked three suspects on various felony charges related to the incident: Melissa A. Arambula, 35, of El Monte; Sean M. Clemens, 45 of Covina, and Nickolas R. Martinez Jr., 41, of Basset. Arcadia police say in a separate, unrelated use of a bait package, a parolee and a second suspect were arrested on Dec. 16.